JFK visited Trinity College in Washington, DC. where he gave a commencement address. JFK greeting Barbara Bailey and her father and future aide John Bailey. Among the graduates that he personally greeted that day were Barbara Bailey (Kennelly), who later served as a Congresswoman from Connecticut. 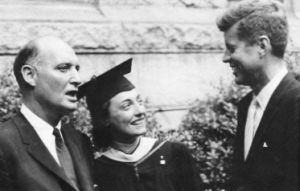 Her father John Bailey served as a key aide in Kennedy’s 1960 campaign.